King Mendanbar, Monarch of the Enchanted Forest, is having trouble with wizards burning up bits of his forest. 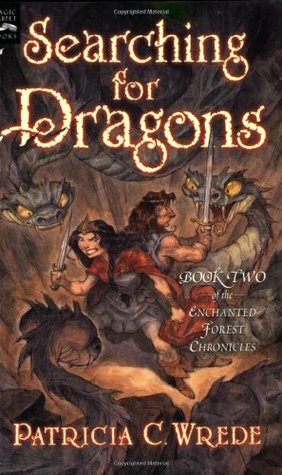 He visits Kazul, the King of the Dragons, for some advice, but Kazul is missing, and Mendanbar teams up with Princess Cimorene to find Kazul and restore the Enchanted Forest. I enjoyed this book even more reading it for the second time! I still wish that there were a little more romance between Mendanbar and Cimorene, but I do enjoy their friendship and the way they respect and rely on one another through all the sticky magical situations they find themselves in. There are so many delightful characters in this book! Even the side characters shine with originality and wit. The basic plot is rather straightforward, but there are so many misdirects and twisty roads for the characters to get delayed and misguided and thrown off course, that it feels like a complex plot.